The TFT “Ultimatic 125” has an unprecedented flow range of 10-125 GPM. The compact size and reduced weight of this automatic nozzle make it an outstanding performer for 1” as well as 1.5” hose. The “Ultimatic 25”features flush without shutting down, moulded rubber bumper with “power fog” teeth, detent flow control, “Gasket Grabber” inlet screen, exclusive TFT slide valve, optional colour coded pistol grip and the rugged dependability you have come to expect from Task Force Tips. The “Ultimatic 125” is available in several configurations for a wide variety of applications. It is adjustable from a straight stream to a dense fog pattern. The TFT Mid-Matic series has all the features of the TFT automatic handline, but in a smaller more compact size. With a wide flow range of 70-200 GPM, the Mid- Matic series can be used on 1.5”, 1.75” and 2” hose. The Mid-Matic features flush without shutting down, moulded rubber bumper with “power fog” teeth, detent flow control, “Gasket Grabber” inlet screen, exclusive TFT slide valve, and the rugged dependability you have come to expect from Task Force Tips. Most Mid-Matic models are fully NFPA compliant, and are available in tip only configuration, with stainless steel slide valve, and optional coloured-coded pistol grip and handle covers. A TFT Mid-Force has the functionality of the TFT Dual –Force, only it’s smaller. The wide flow range of 70-200 GPM allows the Mid-Force to be used on 1.5”, 1.75” and 2” hose. 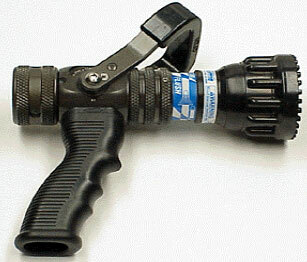 The TFT Mid-Force is a truly rugged, dependable and effective mid-range firefighting nozzle. This nozzle is equipped with a low-pressure override, which allows the nozzle to achieve greater flows at lower nozzle pressures. All nozzles are regulated to 100PSI ± 15 PSI according to NFPA #1964 flow requirements. It is adjustable from a straight stream to a dense fog pattern. Handle covers and pistol grips are available in NFPA colours to identify a nozzle with its discharge.